The six members of Forastero take to the stage with a baritone saxophone, keyboards, synths, double bass, guitar and drums. Then there’s the unmistakable sound of a theremin and Hammond organ that looks like it’s on its last legs. However, this unlikely arsenal of musical instruments has found favour within the Madrid’s underground jazz scene. Regularly, Forastero play to packed houses, as they unleash their captivating, genre-melting sets. This is sure to find favour much further afield. Already, Forastero are the toast of Madrid’s underground jazz scene. Recently, their fuzzed-up sound and leftfield beats are beginning to find favour with audiences in other parts of Spain. They’ve been won over by Forastero’s unique, trademark sound. It’s been inspired by the Cinematic Orchestra, Jaga Jazzist, Red Snapper, Esbjörn Svenson Trio, Acoustic Ladyland and the soundtrack to spaghetti westerns. All these disparate influences have helped to shape Forastero’s music over the last few years. However, Forastero are hoping that their music will soon, their music will find a much wider audience. So far, Forastero are well known within Spain’s underground music scene. Alas, outside of Spain, Forastero are relative unknowns. That could all be about to change, when Forastero release their much anticipated debut album, El Submarinista en el Tejado. It will be released by Madrid based Lovemonk Records on Friday the 2nd of December 2016. This is the cumulation of fifteen months of hard work for Forastero. For their debut album, members of Forastero had penned eight new tracks. They were joined by cover versions of The Orb’s The Box and Roger Webb’s Medicine Man. These tracks were recorded over three sessions at various studios in Madrid. The first recording session began on September 24th 2015 at Reno Studios, in Madrid, with Forastero co-producing the album with Luca Petricca and Borja Torres. Their rhythm section featured drummer Javier Gallego, bassist Javier Diez-Ena who also plays theremin and guitarist Javier Colis. They were joined by baritone and alto saxophonist Dani Niño; Juan Carlos “Chavi” Ontoria who played keyboards, piano and organ and Sergio Salvi who switched between synths and keyboards. Between the 24th and 26th September 2015 Forastero recorded El Submarinista en el Tejado, Frenesí, and Morfina. They didn’t return to the studio until May 2016. Forastero reconvened at Estudio Uno on May 8th 2016. Over the next two days, they recorded six tracks, including The Box, Baile Watusi, Por la calle de la amargura, El dolor del dinero, Medicine Man, and La balada. By the 9th of May, Forastero’s debut album was almost complete. Less than two months later, Forastero recorded Dormíamos, depsertamos on July 5th 2016 at Red Led. This was the final track on El Submarinista en el Tejado. After eight months, and a little help from their friends, Forastero’s debut album was complete. It had only taken six days for Forastero to record El Submarinista en el Tejado. Now their thoughts turned to the release of what became El Submarinista en el Tejado. Now five months later, and Forastero are preparing for the release of their much anticipated debut album, El Submarinista en el Tejado. It will be released on one of Madrid’s most prestigious labels, Lovemonk Records. El Submarinista en el Tejado is an album that should introduce Forastero to a much wider audience. The title-track opens El Submarinista en el Tejado. A scrabbled bass is joined by sci-fi synths before crispy beats appear. They soon disappear only to reappear. Meanwhile, a piano is stabbed and then is played with a fluidity, as a rocky guitar threatens to cut through the arrangement. It does, and by then, Forastero are fusing disparate musical genres. Elements of avant-garde, improv, jazz and rock melt into one. By then, a braying saxophone howls and wails, as banks of synths join keyboards and the rhythm section. Together, they power the genre-melting arrangement along. Forastero combine power and speed as they play with fluidity and confidence. Soon, they’ve kicked loose and are showcasing their considerable skills on this cinematic track, that pays homage to The Maestro, Ennio Morricone and in the process whest the listener’s appetite for the rest of the album. A dark, mesmeric bass synth open Frenesí. It’s joined by a vortex of ghostly synths. They’re a reminder of Forastero’s love of spaghetti western soundtracks. Soon, the bass and then piano join with the rhythm section and braying horns. Together, they power, and drive the arrangement along. By then, Forastero are at their tightest, their rhythm section locking down the groove as the horns unite. That’s until the horns are replaced by alarming, futuristic, whirling, swirling and bubbling synths and a pounding piano. The piano drives the arrangement along, as horns rasp and bursts of blistering guitars are unleashed. With the rest of Forastero, they create an urgent, dramatic and captivating soundtrack-in-waiting. Straight away, there’s an element of drama in Forastero’s rework of The Orb’s The Box. This comes courtesy of the drums, sci-fi sound. They’re joined by braying horns, a dusty old Hammond organ, a piano and guitar. Together, they add a cinematic sound. This continues until the arrangement veers between jazz, ska and dub. Then the arrangement flows along, with the Hammond organ adding washes of a sixties soul jazz sound. Mostly, the cinematic sound is omnipresent, as pizzicato strings, piano, shimmering surf guitars and later, growling horns are added. The result is a glorious musical potpourri, that features Forastero at their most inventive and imaginative. Seamlessly, they fuse everything from dub and electronica through to ska and soul jazz to surf rock, and in the process, bring new life to a familiar track. Dark synths play slowly and ominously on Dormímos, Despertamos. They’re joined by a reverberating guitar and washes of Hammond organ. Gradually, the track begins to reveal its secrets, as instruments are added and layered. This includes braying horns and keyboards. They become part of a captivating, but almost understated, multilayered arrangement. Later, the arrangement is stripped bare, and just a standup bass and drums remain. To this, keyboards, rasping horns and chiming guitar are added. Forastero having rebuilt, continue on what’s a quite beautiful, melodic track, that shows another side to their music. Straight away, there’s a moody cinematic sound to Morfina. A bass is plucked and combines with a searing, droning guitar. Soon, they’re joined by an electric piano that’s reminiscent of the piano that features on The Doors’ Riders On The Storms. It’s joined by growling horns. They’re a game-changer. Suddenly, the tempo increase as a Hammond organ and guitars joins with the rhythm section. From there, the arrangement ebbs and flows, growing in power and drama, before becoming understated. hypnotic, buzzing sound takes centre-stage. It’s soon replaced as Forastero unite and jam and combine elements of jazz, improv, rock and soul. Washes of Hammond organ add elements of sixties soul jazz. Later, when Forastero lock down a groove and play as one, they’re reminiscent to the Jim Hendrix Experience, as Marfina reaches its dramatic and memorable crescendo. A growling jazz saxophone opens Baile Watusi before, the arrangement explodes into life. Percussion joins with swirling washes of Hammond organ as the rhythm section power the arrangement along. Blistering machine guitars are unleashed as Forastero urgently combine jazz with rock. That’s until the tempo drops, and the track heads in the direction of sixties soul jazz and sinuous, snaky funk. Forastero it seems, are musical chameleons who constantly seek to reinvent themselves. That’s the case on Por la calle de la Amargura. Straight away, it takes on a late-night, smoky jazz-tinged sound. Forastero plays slowly and create an understated arrangement. It features shimmering guitars, braying horns and a walking bass. Later, choppy beats add an element of drama, as the arrangement takes on an urgent, choppy and flamboyant sound. Horns bray as swirling washes of Hammond are added to what’s a beautiful, dramatic track. Medicine Man is the second cover version on the album. Stabs of futuristic synths send out a siren call, as the rhythm section join with a scorching guitar. Soon, they’re joined by banks of keyboards, as Forastero embark upon another jam. Seamlessly, they combine elements of avant-garde, electronica, free jazz, Latin and rock. As they do, Forastero play with a freedom, reinventing Roger Webb’s original track and taking it in new and unexpected directions. La balada del hueso lamido closes El Submarinista En El Tejado. A piano plays slowly and thoughtfully, leaving space for the theremin. They might seem like unlikely bedfellows, but work well, before the arrangement explodes into life. Forastero’s rhythm section power the arrangement along, as horns growl. Meanwhile, the unmistakable and eerie sound of theremin floats above the arrangement. It ebbs and flows, and takes on a meandering cinematic sound. This gives way to futuristic free jazz, as the theremin and horns lock horns. Somehow, this works and the arrangement continues to ebb and flow. Later, the arrangement becomes ethereal and dramatic, before becoming choppy, urgent and indeed memorable, as Forastero bid the listener a farewell. That’s until the next time. Before that, Forastero will release their much anticipated, genre-melting debut album El Submarinista En El Tejado on Lovemonk Records. It finds the Madrid based sextet showcasing their considerable skills. They do this, whilst seamlessly switching between, and fusing disparate musical genres and influences. It’s akin to a magical mystery tour. Forastero head on a journey that encompasses avant-garde, dub, electronica, free jazz, funk, rock, sixties soul, ska, soul jazz and surf rock. To this, Forastero add a variety of musical influences. This includes the soundtrack to Ennio Morricone’s Spaghetti Westerns and the music of Brandt Brauer Frick. They’re are part of Forastero’s cinematic sound on El Submarinista En El Tejado. Other influences include The Doors, Jimi Hendrix and Sonic Youth. These just a few of the artists who have influenced Forastero on their debut album El Submarinista En El Tejado. It features the many sides of Forastero. One minute they’re a tight band as Forastero lock the groove down, the next they play with a looseness that allows and affords improvisation. Not every band are capable of this. However, Forastero are not every band. Instead, Forastero feature six talented and versatile musicians. They’ve spent the last few years honing and perfecting their sound. This has paid off. 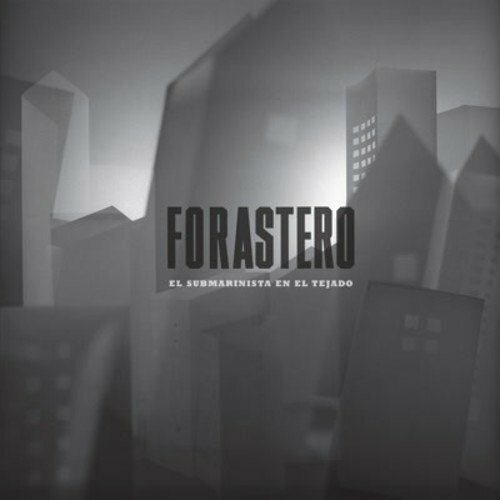 Forastero’s debut album El Submarinista En El Tejado should introduce Forastero to a much wider audience, and transform their fortunes. Already Forastero are familiar faces within the Spanish music scene. That however, could be about to change after the release El Submarinista En El Tejad. It will introduce Forastero’s music to a much wider audience, outside of their native Spain and in the process launch the career of the Madrid based musical adventurers. ← SUN RA- SINGLES THE DEFINITIVE 45s COLLECTION.